At a time when the Trump/Pence regime is vilifying and targeting Muslims, refugees, and Latino and other immigrants, protests on April 24 Holocaust Remembrance Day in a number of U.S. cities drew the links between the enormous crimes against humanity committed by Hitler and the Nazis and what is happening in this country today. These actions sounded an urgent alarm about the dangerous course of the Trump/Pence regime and sent out the message: never again must we allow another Holocaust to happen to any group of people. 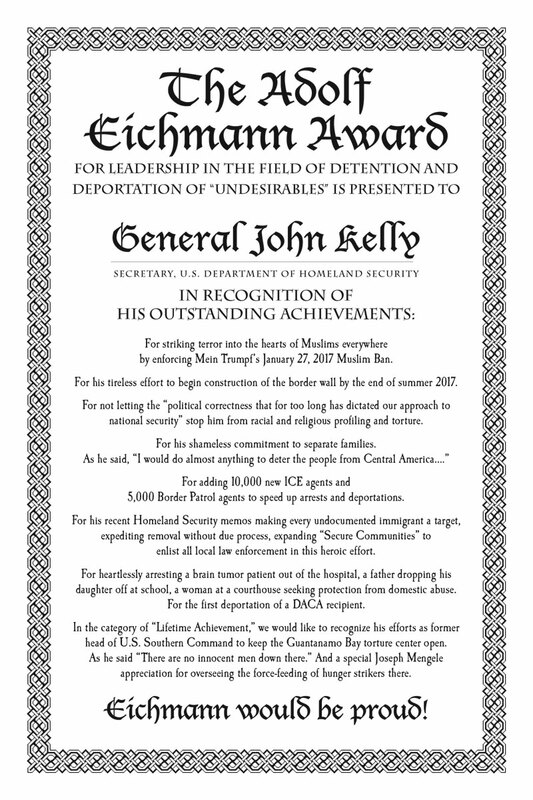 As part of the protests on this Holocaust Remembrance Day, the “Adolf Eichmann award”—“for leadership in the field of detention and deportation of ‘undesirables’”—was given to John Kelly, the U.S. general now heading the Department of Homeland Security. Eichmann was in charge of deporting Jews to the Nazi concentration camps. And the “Joseph Goebbels award”—“for demonizing and persecuting ‘undersirables’”—went to Jeff Sessions, Trump’s attorney general. Goebbels was minister of propaganda for Hitler. In the days before Holocaust Remembrance Day, Sessions and Kelly went to the U.S.-Mexico border and issued rabid threats against undocumented immigrants. They, and the regime as a whole, are ratcheting up fascist measures and a climate of demonization and marginalization of immigrants that echo how the Nazis targeted Jews as “subhuman,” “undesirables,” and “enemies,” setting the stage for the Holocaust. The following is based on reports we received on the Holocaust Remembrance Day actions in several cities. About 25 people gathered in front of the Jewish Heritage Museum in Manhattan. Travis Morales opened by speaking directly to the connection between the escalating attacks on immigrants and Muslims by the Trump Regime and the demonization and targeting of the Jewish people by the Nazis. He said this has a logic and momentum that can lead to real horrors. Scott Gilbert, whose parents were Holocaust survivors, and whose mother was a childhood friend of Anne Frank, spoke about the parallels between Germany in the 1930s and Trump’s America. Citing Trump’s senior advisor Stephen Miller, who declared that the president’s authority “will not be questioned,” Gilbert compared it to a similar quote from Hitler’s propaganda minister Joseph Goebbels. He said that if “Never Again” is going to mean anything, it has to mean something now—when immigrants, Muslims, and people all over the world are being threatened by the Trump/Pence fascist regime in the most powerfully militarized country on earth. Statements in support of this action were sent to Refuse Fascism from David Meyerhof, grandson of Holocaust survivor and Nobel Prize winner Otto Meyerhof; Creighton University professor Fidel Acosta-Fajardo, who is one of the professors on the right-wing “Professors Watchlist”; Donald W. Shriver, President Emeritus of the Union Theological Seminary; and others. 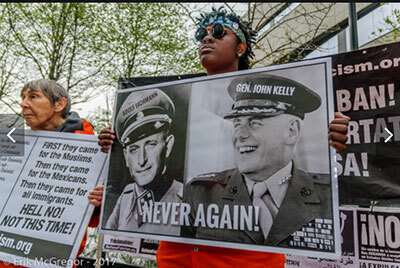 A determined and diverse group gathered in the downtown Loop to loudly and colorfully declare “Never again will we allow another Holocaust to happen to any people!” Carrying signs from Refuse Fascism saying “NO!” in many languages and a banner declaring “From 1933 to 2017, Never Again! Drive Out the Trump/Pence Regime!” they lined up in front of the Loop Synagogue, which was the target of a fascist attack in February when the building was defaced with swastikas and windows broken. Bob Avakian, "Why do people come here from all over the world?" A clip from Revolution: Why It's Necessary, Why It's Possible, What It's All About, a film of a talk by Bob Avakian given in 2003 in the United States. Brother Michael C. Oboza, speaking as a member of the LGBTQ/Bi community, shared that he had been a Catholic who didn't believe that the Holocaust really happened, but then learned that 15,000 gays and suspected gays were among those killed in the Holocaust, and many more forced to wear the pink triangle. The MC reminded those gathered and the press that the U.S. has already registered and rounded up a whole group of people and sent them to concentration camps—people of Japanese descent during WWII. The day before this action, two Refuse Fascism people went out to the Holocaust Museum in Skokie, outside of Chicago, to attend their Holocaust Day program. The moving program was led by Holocaust survivors who lit candles for the Jews the Nazis killed. The MC, a Holocaust survivor, said the Holocaust Day honors the date for the beginning of the Warsaw Ghetto uprising, which he called "the most significant armed resistance to the Nazis." There was a procession through the downtown streets of people in prison uniforms, representing the victims of the Holocaust. The procession included Jewish activists, members of the Refuse Fascism Los Angeles chapter, and people who had come from a march of 2,000 people earlier in the day marking the genocide of the Armenian people by the Ottoman (Turkish) empire in the early 1900s. 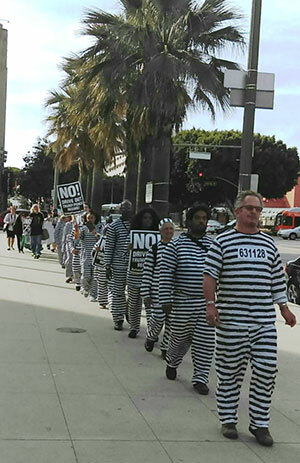 People lined up outside of the LAPD headquarters dressed in prison uniforms representing victims of the Holocaust. 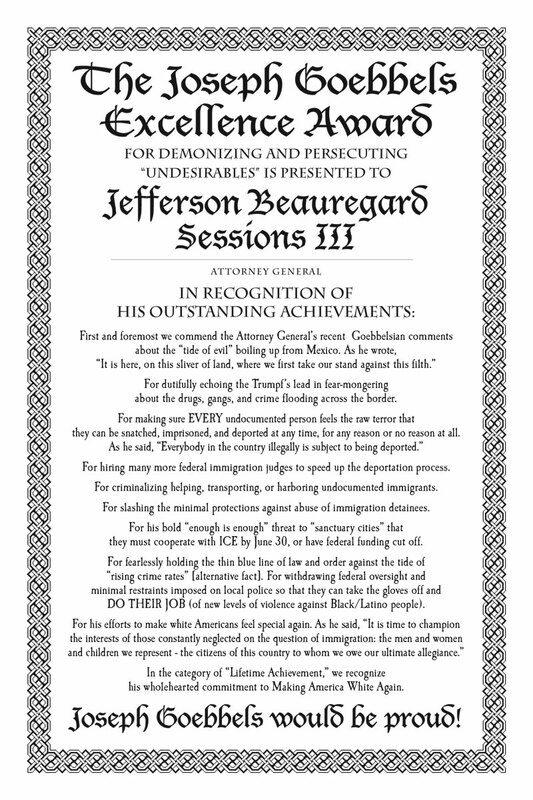 They attempted to deliver a hand-written “award” to the head of the L.A. County Sheriffs Department, stating, "You, Sheriff Jim McDonnell, head sheriff of LA County are being presented with the Adolf ICEman Award for collaborating with the Fascist Trump/Pence regime and for your collaboration with ICE in carrying out deportation." The procession then took off. In a single line, the procession, trailed by supporters chanting "Never again to any people," walked through downtown city streets filled with heavy afternoon traffic. They walked through a section of Little Tokyo and stopped in front of the Japanese-American Museum. Connections were made between the horrors of the Holocaust, the concentration camps for people of Japanese descent in the U.S., and the atomic bombing of Hiroshima and Nagasaki. The procession then went to the MDC (Metropolitan Detention Center). 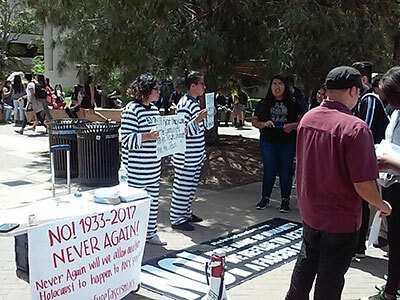 The Holocaust Remembrance Day was also marked by a group of people on the University of California Los Angeles campus. Several dozen people gathered at the S.F. headquarters of ICE for the Bay Area region. Three members of Holocaust survivor families spoke. Roman Rimer, a member of Refuse Fascism, and the Bay Area Queer Anti-Fascist Network, told of growing up with the stories of his grandfather’s family members who were killed in the Holocaust in Poland. He then turned toward the ICE building and denounced the enforcers in that building for their actions that are tearing families apart and creating great pain and sorrow. 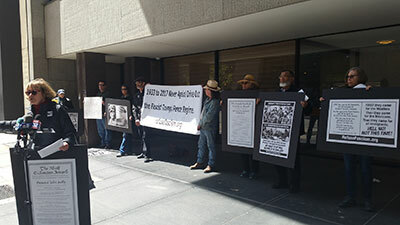 Following the rally a delegation from the protest attempted to “deliver” to ICE authorities in the building the Joseph Goebbels award to Sessions and the Adolf Eichmann award to Kelley in recognition of their persecution of immigrants, in loyal service to the fascist Trump/Pence regime.